Originally designed in 1938 by the engineer Giuseppe Salmaggi and completed two years later, the half-liter became the most sought after motorcycle by the sporting privateer racers of the time. The single unit engine was a departure from the norm of the day: beside having clean lines all the components were easily removable without taking the engine out of the frame. That is, with the exception of the crankshaft. After the Second World War the Saturno road machine was equipped with girder forks in conjunction with an unusual rear suspension system designed by Guiseppe Gilera in 1934. The system comprised vertical levers compressing horizontal springs enclosed in tubes integrated in the frame. The back of these tubes had another set of springs for rebound damping. A set of adjustable friction dampers was connected between the rear forks and the back of the tubes containing the springs. This was quite a sophisticated design since most of the motorcycles of the time had a hard tail. The Gilera Saturno could be had as an “over-the-counter” racer with aluminium fuel tank and aluminium rear mudguard and was named the Gilera Saturno Competizione. She has a close ratio gearbox, camshaft 10000, valves 44/46 mm, carburettor Dell`Orto SSF35M 35mm, 50 mm exhaustpipe, 1" handlebars. She develops 36HP at 6000 rpm. When the bike was purchased it had been in a Dutch and in an Italian collection for a long time. Before the bike was started after a long period of inactivity, various side covers were opened for inspection and all internals appeared to be near new with balanced crank and camshaft. Electrical system with Marelli dynamo, electronic 12 V regulator, SIEM headlamp, taillight and battery. All modifications can be reversed without any damage or alterations to the original design. 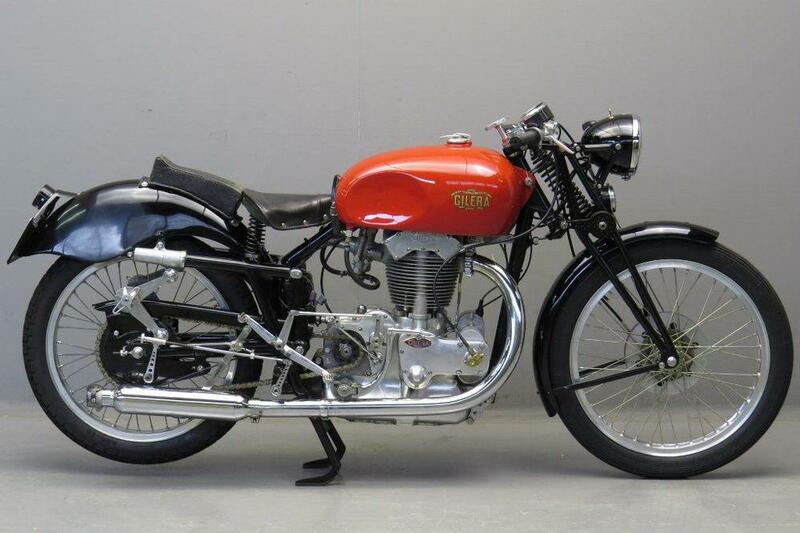 This rare 1949 Gilera Saturno Competizione 500cc OHV is a very well restored and well running Italian superbike but it will take a brave man to exploit its full potential on the road. Exotic, technically advanced and a beauty to look at.